Great UK 2-on-1 reissue of the United Artists albums In A Soulful Mood and Killing Me Softly, released in 2013 by Vocalion. If you search for Piano Duos on the Internet, you will discover an amazing number of entries. There was a time when such performers were very popular, and some even topped the bill at variety theatres in the days before television took over as the main form of entertainment for millions. In Britain, Marjan Rawicz and Walter Landauer were probably the best known for many years, but in America two pianists emerged from their musical studies in the 1940s to become the most popular and successful of them all, achieving worldwide fame. The Juilliard School of Music in New York has been responsible for educating numerous young musicians who went on to have professional careers. Arthur Ferrante (1921-2009) and Louis Teicher (1924-2008) became friends while studying the piano, and they enjoyed amusing themselves and friends by exploring the technique of performing duets. In 1947, they decided to take advantage of the skills they had mastered, and became fully-fledged concert pianists. In the early days they had to accept work where it was available, which often meant nightclubs and similar venues, but gradually they developed the classical side of their repertoire and began performing with orchestras. It wasn’t long before they realized the opportunities available in the semi-classical or easy listening repertoire. This was when long-playing records were becoming very popular and there was a demand for the kind of light orchestral and instrumental music that had a wide appeal — especially among collectors who could afford to buy records at that time. After making a few recordings for MGM and Columbia, their careers received a welcome boost in 1955 and 1956 when a contract with the Westminster label produced eight LPs that got them noticed. ABC/Paramount took them on for five albums, but things really started happening when they signed with United Artists. From 1960 until 1979, they made over sixty albums covering a wide range of material, although their fans seemed to want an endless supply of music mainly associated with films and the musical theatre. They tend to be remembered for the many LPs they made, but they enjoyed four big hits in the US singles charts. One of the most surprising was the theme from the film The Apartment by the British composer Charles Williams, recycling a work he had written for a long-forgotten 1949 British movie The Romantic Age. Other successes included Tonight and themes from the films Exodus and Midnight Cowboy. They ceased performing in 1989, and both retired to homes near each other in Florida. Occasionally they would perform for pleasure at the local piano store. Louis Teicher died of a heart attack in August 2008, three weeks before his 84th birthday. Arthur Ferrante passed away from natural causes in September 2009, aged 88. He had achieved his ambition of living one year for each key on a modern standard piano. One could argue that the first album on this CD, In a Soulful Mood (1974), reveals an attempt to expand the kind of repertoire with which Ferrante and Teicher were usually associated. Soul was beginning to move into the mainstream of popular music, which many music lovers regarded as a welcome antidote to the rather brasher sounds that seemed to be all-pervading. Singer, composer and producer Barry White scored a major success with Love’s Theme, which is one of the few purely instrumental singles to have achieved the top slot on Billboard’s Hot 100 chart. Break Up to Make Up was barely a year old at the time, but it has since become the favorite among the many fans of The Stylistics. Ain’t No Mountain High Enough enjoyed success in 1967 for Marvin Gaye and Tammi Terrell, then in 1970 Diana Ross achieved her first solo hit with her version, which was nominated for a Grammy Award. You Are Everything was also a big hit for The Stylistics, and Diana Ross and Marvin Gaye brought it back to the charts in 1974 although its success in many countries did not results in the release of the sing as a single in the USA. Cristo Redentor is the world-famous statue of Jesus Christ, which stands on the peak of Corcovado mountain above Rio de Janeiro. The legendary jazz pianist and composer Duke Pearson wrote it for jazz trumpeter Donald Byrd in 1963. Yet more hits for The Stylistics were I’m Stone in Love with You and Betcha by Golly, Wow — further illustrations of their status among Soul fans. But they were not alone: My Cherie Amour was written by singer-songwriter Stevie Wonder while still in his mid-teens, although by then he was already a seasoned performer, having been signed by Motown’s Tamla label at the age of eleven. Lady Love was composed by Jon Marcus Lucien, who seems to have escaped being regarded a commercially successful performer, but whose “macho clothed in velvet” baritone (to quote one critic) was possibly influenced by Luther Vandross. Midnight Train to Georgia was a number one hit for Gladys Knight and the Pips in 1973. Ferrante and Teicher’s collection associated with Soul music is completed by two of their own compositions — Hong Kong Soul Brother and Early Morning. Their music may not have converted the Soul aficionados to their style of easy listening music, but it could well have encouraged their loyal fans to appreciate the way in which musical frontiers are continually expanding. 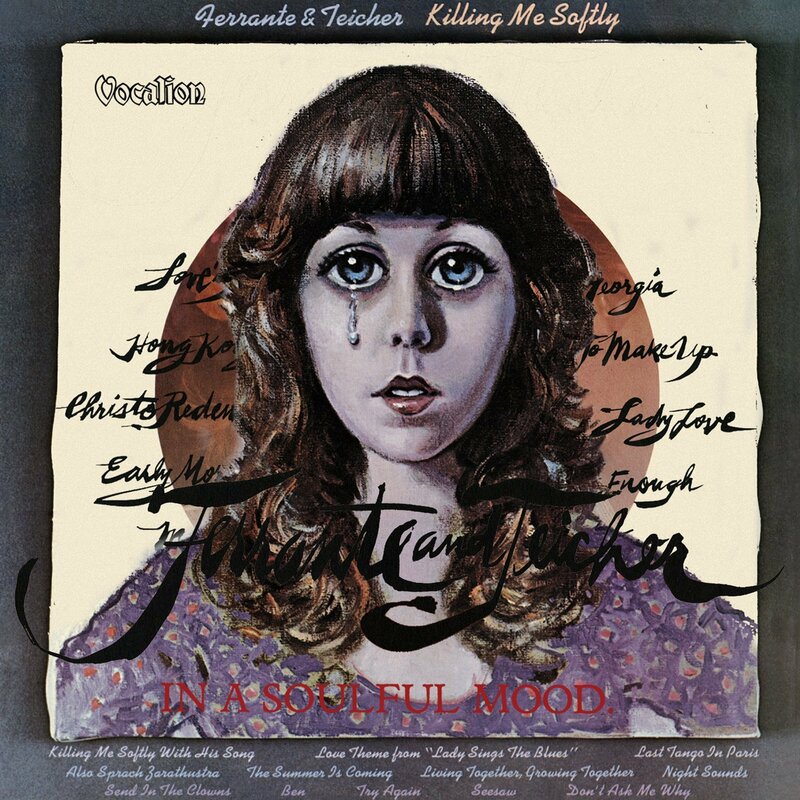 The second album in this collection, Killing Me Softly (1973), offers what had become the familiar Ferrante and Teicher fare of popular melodies, mostly associated with films and the theatre. The first track certainly made a big impact, which continues to this day. It seems incredible that Stanley Kubrick’s landmark film 2001: A Space Odyssey first burst upon cinema screens as long ago as 1968. The use of the German composer Richard Strauss’ tone poem Also Sprach Zarathustra reaffirmed the preference for large-scale orchestral works in suitable films, although it was not the original intention. Both Hollywood composer Alex North and English composer and arranger Frank Cordell had provided musical scores, which were recorded, but eventually discarded in favour of familiar music taken from existing commercial recordings. Stephen Sondheim’s Send in the Clowns has become a standard since it appeared in the 1973 show A Little Night Music. It was written for the British actress Glynis Johns, who had originally created the role of Desiree on Broadway. Killing Me Softly with His Song was a number one hit for Roberta Flack in 1973. American film composer Walter Scharf and British lyricist Don Black collaborated in 1972 to write the title song for the film Ben, which provided Michael Jackson with one of his many hit singles. Last Tango in Paris began life as a 1972 Italian art film, but soon gained notoriety (and much valuable publicity) due to the explicit nature of some of the scenes involving Marlin Brando. It continued to hav censorship problems in various countries for many years, but no such problems affected the music score by Gato Barbieri. The distinguished Hollywood composer and arranger Nick Perito created the version played by Ferrante and Teicher on this album. Lady Sings the Blues was Hollywood’s 1972 tribute to the jazz singer Billie Holiday, with the Love Theme specially composed by Frenchman Michel Legrand. Diana Ross portrayed Holiday, in a performance that won her and Academy Award nomination. The 1973 Broadway musical Seesaw was a financial flop, although it managed to run for almost a year. From the outset, it suffered from drastic rewrites and changes of personnel, which even for the expertise of seasoned composers Cy Coleman and Dorothy Fields proved one challenge too far. The original Hollywood Radio Theatre began in the mid-1930s and survived into the late 1950s when it transferred to television. In the process, it had several changes of name (to reflect the sponsors) and its format of getting top stars to recreate their movie roles in one-hour programmes was a winning formula. It returned to radio in September 1973, syndicated from New York, with a theme (Try Again) composed by Stanley D Hoffman, performed by Ferrante and Teicher — the version on this CD. Lost Horizon was a 1973 musical film based on the novel by James Hilton. Burt Bacharach and Hal David contributed the score, but several numbers were cut following the initial test screenings. Living Together, Growing Together may be a lone survivor. Garry Sherman and Sammy Cahn wrote Don’t Ask Me Why for the 1972 film The Heartbreak Kid. It made the Top 100 List of the funniest American movies ever made, but the 2007 remake starring Ben Stiller was a flop. The two other tracks, The Summer is Coming and Night Sounds were original compositions by Ferrante and Teicher (extra royalties!). Killing Me Softly was the very first Ferrante & Teicher album I ever heard back in the mid-1970s (on quad 8-track!). It was this 2-on-1 CD reissue that prompted me to create the Ferrante & Teicher web site. I purchased the CD on eBay on April 13, 2013 and registered www.ferranteandteicher.info just days later, on April 16, 2013. Because I had more Bert Kaempfert albums than F&T albums, I built the Kaempfert site (www.bertkaempfert.info) first and didn't begin work on F&T until October 1, 2013.